The portfolio of MD Dispensers are engineered for accuracy with a medical structure, yet convey a cosmetic appeal. The MD Dispensers will maintain the integrity of a formulation, while allowing patients to easily and accurately dose medications. The first of its kind on the market, these dispensers feature UV Resistant View Windows for added convenience. 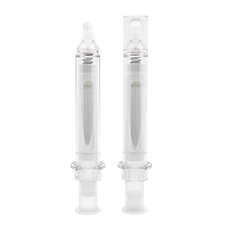 This line offers a diverse selection of dispensers, such as jars, pumps, pens and syringes, so pharmacists can best meet the needs of their patients.